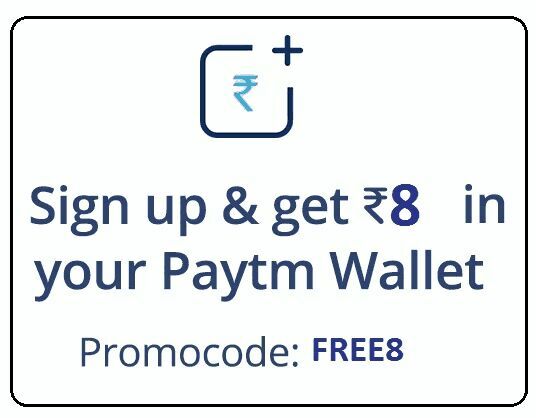 Get Rs.8 Paytm Cash on Signup for New users. Apply below Coupon to avail Free Paytm Cash. Create new account to avail this Offer. 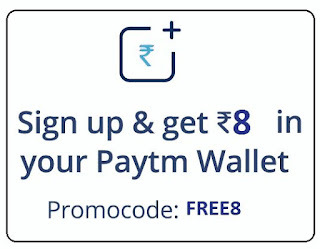 How to Get Rs 8 Free Paytm Cash on Signup? • Enter amount Rs 8 & Click "Have a Promo Code"
• Done !! You will receive your Paytm cash Instantly or within 24 hours. - FREE8 Promo code valid for new users only. - Offer can be availed only once per user. - Valid for a Limited time only.